Review: You've Better Things to Do for "The Next Three Days"
The pedigree-to-garbage ratio of “The Next 3 Days” is sky-high, as writer-director Paul Haggis offers us a host of unlikable people of questionable morality in an effort to say nothing much sensible. And just for kicks, Haggis slaps on an ending that is weak, contrived and too late to matter. The film opens with Lara (Elizabeth Banks) and John Brennan (Russell Crowe) out for dinner one night with his brother, Mick (Michael Buie), and sister-in-law, Erit (Moran Atias). We join the their meal as the women are getting into a heated argument about gender office politics, immediately establishing that Lara has a hair-trigger temper, thereby making her arrest the following morning for murder somehow plausible. Hey, maybe she would brain her boss with a fire extinguisher following a fight we never really get to see about what exactly we're never sure. We then watch John struggle with life as a single father, while dutifully visiting his incarcerated wife. But as the appeals process provides no solace and the stress starts to eat away at him, he devises a desperate plan to spring Lara from prison. Haggis tries to frame John as a modern day Don Quixote, a man standing tall in the face of insurmountable odds, taking solace in his own irrationality. Uh-huh. The way the story unfolds there’s no reason to believe Lara didn’t commit the murder, and John proves himself to be a jerk, leaving us with no one to root for, except maybe their son, who desperately needs to be in a loving home, one where his father doesn’t call him pet names like, “Rat Bag” and (we still can't believe we heard this right and would love to be wrong) “Yard Ape”—yes, “Yard Ape.” Who knew this term was back in vogue, much less a term of endearment? Three years after his wife (Elizabeth Banks) is sent to jail for murder, Russell Crowe decides he must break her out so their family can be together again. Beyond its completely despicable protagonists, the film is littered with 2-dimensional supporting players, talented folks like Olivia Wilde, RZA, Brian Dennehy and Daniel Stern, who deserve better. John possesses superhuman stamina, somehow keeping his job as a college professor, raising his child, visiting his wife in jail, staking out the prison and some other businesses, and still finding the time to train himself in the dark of arts of crime necessary to free his wife. It’s a mind-boggling display. It’s difficult to get into just how bad and manipulative this film is without divulging too much of the plot, but John is no Don Quixote, the odds against there being a lip-reading forger in that bar are absurd, $1,483 simply isn’t enough money and the reveal at the end doesn’t just test the limits of plausibility, it grinds them into bits, spits on them and kicks them down a gutter. "Harry Potter and the Deathly Hallows" Trailer Is Here -- Enjoy! 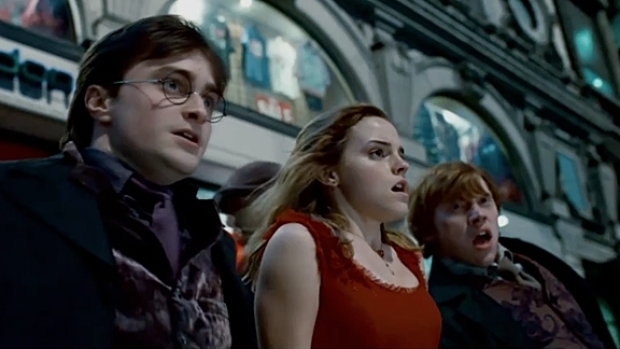 Harry and his posse return for the first half of the final showdown with the wicked Voldemort. Nothing we could possibly say will sway/inform your opinion, you're stoked or you're not. Even the tag line for the film—"What if you had 72 hours to save everything you live for? "—is a manipulative lie. John has months to plan the escape, and if your spouse is everything you live for, then either you have no kids or, like John, you’re a lousy parent. And then there are throwaway moments in the film, like when John’s family is at the police station eagerly awaiting word of how the manhunt turns out and his sister-in-law Erit accosts the lead detective on the case to complain about the quality of the coffee offered by the Pittsburgh PD. Ugh. If you do see “The Next 3 Days,” just remember, you were warned. Naomi Watts and Sean Penn star as Valerie Plame and Joe Wilson, the real life couple who found themselves in a fight with the Bush Administration about Saddam Hussein's WMD program.